Crunchy paleo caveman’s balls are packed with nut butters and chia seeds. They’re quick to make and easy to change the flavour to your liking. 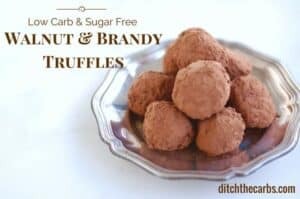 They are unlike most paleo balls or bliss balls which are usually made with medjool dates or other dried fruit in the false belief that makes it sugar free. 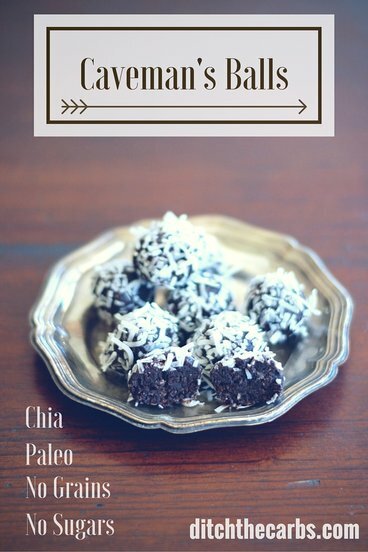 These are little balls of happiness made with healthy fats, nuts, coconut and chia. I try to make all of my recipes as adaptable as possible. With these Caveman’s Balls you can change the nut butter to whichever nut butter you like the most – cashew, almond, tahini etc, add flavours such as orange zest, mint, almond essence and roll in coconut, crushed pistachios, or cocoa. 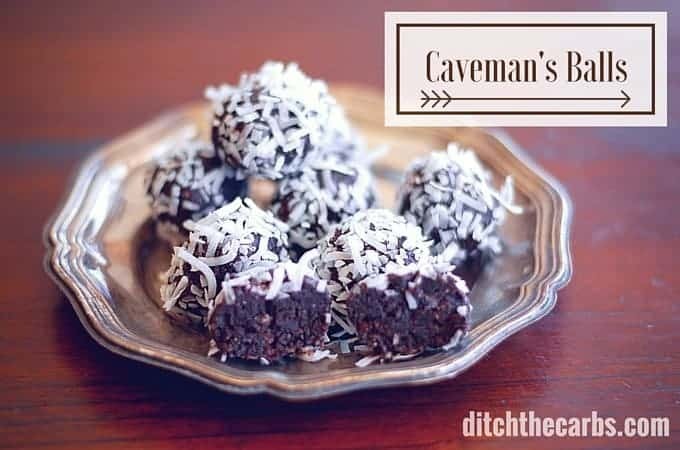 Caveman’s Balls are made with coconut oil, but if you are not strictly paleo, you can use butter for a richer flavour. What combination would you make? TOP TIP – make the Caveman’s Balls then roll in coconut, cocoa powder, crushed pistachios, or even almond flakes. Caveman's balls (or call them what you will) are a perfect antidote to bliss balls that are full of dried fruit (which is nothing more than dried sugar). Crunchy, chocolatey, coconut balls that are a nice little sweet treat. Blend all the ingredients together in the food processor or use a stick blender with the blade attachment. Roll into balls and place on a plate. Refrigerate then roll in coconut, nuts or cocoa powder. All measurements can be approximated then adjusted to your taste. Here are a selection of other sweet treats that are low carb, no added sugar and grain free. This is the first time in all the recipes I have made of yours that it didn’t work for me! Can you help me figure out what I did wrong? I mixed everything in my food processor, but it came out so liquidity I couldn’t roll it. Now they look like big brown mounds in my fridge lol they will be little caveman paddies but I’d like to get these to be in a ball form next time. It has been the best tasting energy bite I’ve had! Help please!! It sounds like the coconut oil has melted at room temperature. Coconut oil has a very low melting point, so pop the melted mix back into the fridge to allow it to solidify again, but before it sets rock solid, bring it out, roll the balls and dip in coconut as shown, voila! I can’t believe you’d refrigerate them BEFORE rolling them in coconut, how would it stick? Nit nearly as well I’d imagine. I view it that is good written, fast to comprehend. site where each pupil or pupil can find ratings gpa levels. I have made a double batch, kids love it. Initially, The muxtire was not thick enough to make the balls, but after two hours in the fridge it was easy. My worry is fytic acid, in nut butter, chia, cocoa.??? Could I just substitute butter for the nut butter? Nut butters can be hard to find (peanut butter being the exception, but it’s the one nut not allowed on slow carb because of its high carb content) not to mention pricey! You could, although it may be a little bit bland as there won’t be the flavour from the nuts. How about tahini? It’s much cheaper and lower in carbs. We like these quite a lot! I’ve made them several times and have changed them up a bit. I up the chocolate flavor by replacing 25g of the nut butter with cocoa butter and add some cocoa nibs. Once when I was making these at a friend’s house and couldn’t find her cinnamon I subbed Chinese 5 spice powder and that has become our favorite now. 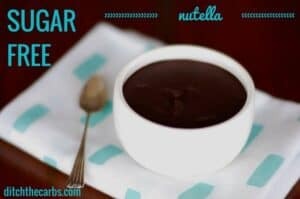 Don’t know what the nutrition profile is with the changes but I know they’re still fat bombs! How many servings are 93 calories worth ? Serving size is one ball. Recipe makes 12. I just tried making these and followed the instructions exactly, but for some reason, the batter didnt have the consistency of being thick enough to roll into balls (it was almost too liquidy). I just made it into a brittle by spreading it on parchment paper in a square plate… what did I do wrong? May I also note that I used Tahini as my nut butter… maybe that has something to do with the consistency? It sounds like your coconut oil was too warm. Next time, just pop it back in the fridge to set and harden a little, it will easily roll into balls then. Well done for making them into an alternative shape. I hate waste. Thank you! I didnt really enjoy the flavor… it almost tasted salty. Is that from the tahini or coconut? Is there a replacement for all the coconut you use in the recipe? Sorry, brand new to low carb living and trying to find recipes that can become staples. I’m not sure why it would be salty, I imagine it was from the tahini. Mine is unsalted. Take a look at your label to check. 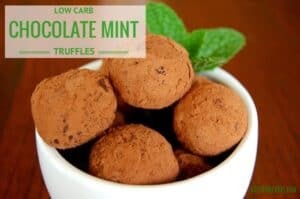 There isn’t an alternative for the coconut in this recipe, you might like my Mocha ice bombs or my mint truffles, they might be easier for you. 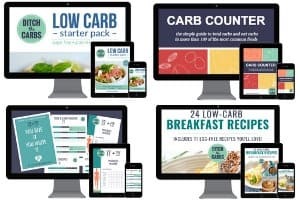 If you are new here, you will enjoy making all these new low-carb recipes and finding staples. My first one was spaghetti bolognese and all my slow cooker recipes. Then I slowly branched out making more and more. You slowly get into a “new normal” and a new routine. Is there a substitution for the chia seeds. They give me the chills, lol! Yes, you could use some more crushed seeds and some psyllium husks which would swell with the liquids to make them set. I’m not sure of quantities as I would have to develop a whole new recipe so add a little at a time until the consistency is correct. Unfortunately my food processor has broken halfway through the mixing process (I added almonds instead of almond butter with the hope that it would all eventually mix in well). All the ingredients are mixed, just not well enough to remain solid and together. Any suggestions on what I can add to make it more of a slice? What a shame. You could add some melted butter and pop the whole mixture in a tray and freeze to make frozen chocolate bark? If adding a protein powder.. for example pea protein, would this really change the consistency? I think it might make them more solid, it would be quite nice however. Yes, then they could be frozen fat bombs – great idea. You could defrost one at a time. 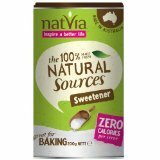 Is there any replacement for stevia.? I dont tolerate it at all. Or can it just be left out without upsetting the texture? Have you tried erythritol? Swerve? They make for a lovely sweet flavour without the aftertaste. Nut butter just refers to any butter made with nuts such as peanut butter, cashew butter, almond butter, etc. You will find them near the regular peanut butter, or in the health food aisle. I was unaware of all these varieties before I started out. I have s nephew coming over that’s allergic to nuts. Can I sub the nut butter for something else? Sure. You could use tahini which is sesame seed butter if he can tolerate that or you could just add some more butter. Mine were super soft too so I decided to spread the mixture out like a slice and have sprinkled crushed pistachios on top before popping it in the fridge. Mmmmmmm! One question, do you have a recipe for creamy suga r free chocolate ? No but you could make my chocolate fat bombs which are pretty close. Love the name! And anything with shredded coconut! Can you tell me how much nut butter in cups ? I would estimate it would be approximately 1/3 cup. I use weight as it is more accurate and nut butter especially is difficult to measure by volume. Sorry, I don’t want to be a pain, but mine ended up being too soft to roll in balls. I’m not sure what I did wrong. Did you pop them the fridge? That makes them easy to roll. better late than never – I use softened butter instead of coconut oil and they stick together! is desiccated the same as shredded? Yes, sorry I must remember to use both terms. Absolutely delicious & a real Christmas treat – thank you Libby! I tried mine with tahini & just a little stevia (sweet tooth in check 🎉). Merry Christmas & thank you so very much for helping me turn 2015 into such a healthy and energised year through your FABULOUS website. Gemma you are a sweetie 😉 I’m so glad you like them and the name didn’t put you off. I love your recipe ‘tweeks’. Merry Christmas and I am so glad you are enjoying my recipes and they are helping you remain low carb. Libby. Are the Carbs ‘net’ or is some of that Fibre? So net carbs would be… 1g? They are total carbs so deduct the fibre if you are counting net carbs.